One of our most treasured Academy team members, Gerd Janson is the quintessential DJ’s DJ, unearthing the gems that get other music lovers hot and excited. The man has his plate full. Whether at the helm of the long-running Liquid club night at Frankfurt’s Robert Johnson with DJ comrade Thomas Hammann, dishing out simmering analog House as co-owner of label Running Back, or penning many a story for Germany’s Spex and Groove magazines, not to mention his scholarship of American studies, he seems to run on more powerful batteries than the rest of us. Enjoy this adventure through magic dance music new & old, with special guest appearance by Kool DJ Pink Alert. It’s risky, but it’ll make you frisky. In the 2nd we will have local sexpots Last Waltz. 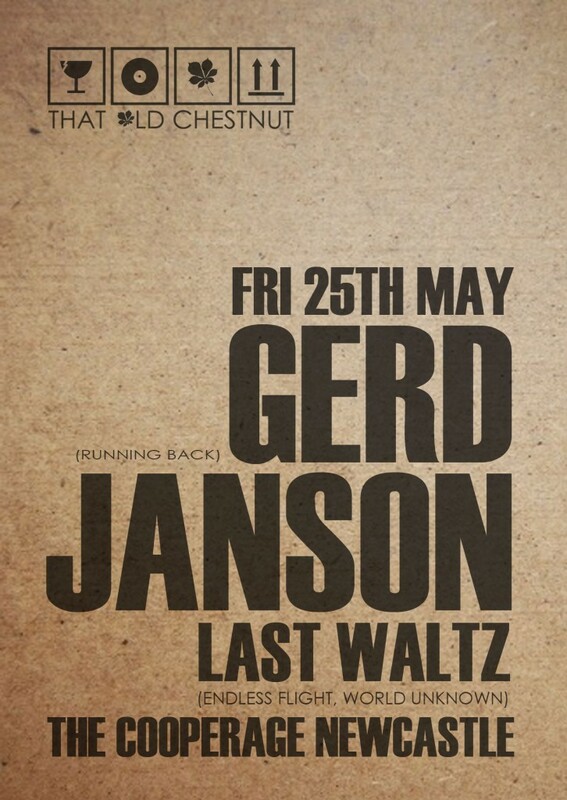 Last Waltz are Geoff Leopard, Mick Rolfe & El.Dee, 3 DJs / Musicians / Producers from the North East of England. 2012 sees them releasing music on labels including Endless Flight, Futureboogie, World Unknown, Tusk Wax and many others, as well as sharing the bill alongside world famous DJs such as Deetron, Joy Orbison and Trevor Jackson at parties around the UK and even as far afield as Croatia’s Garden Festival. As well as running the excellent Dada parties around Newcastle. Check out http://www.tourist-mag.com/ and their soundcloud for a bit more of what these chaps are about. Full line up for the night…. Tickets will be available for £8. On the door will be £10. This entry was posted in Gigs and tagged 6th Finger, Disco, Gerd Janson, House, Ian Blevins, Last Waltz, Newcastle, Techno, That Old Chestnut, The Cooperage. Bookmark the permalink.